In September 2017, Genesis acquired the rights to the highly prospective Barimaia Gold Project (“the Project” or “Barimaia”), located in the Murchison district of Western Australia, opening up an exciting new front for its gold exploration and growth activities. 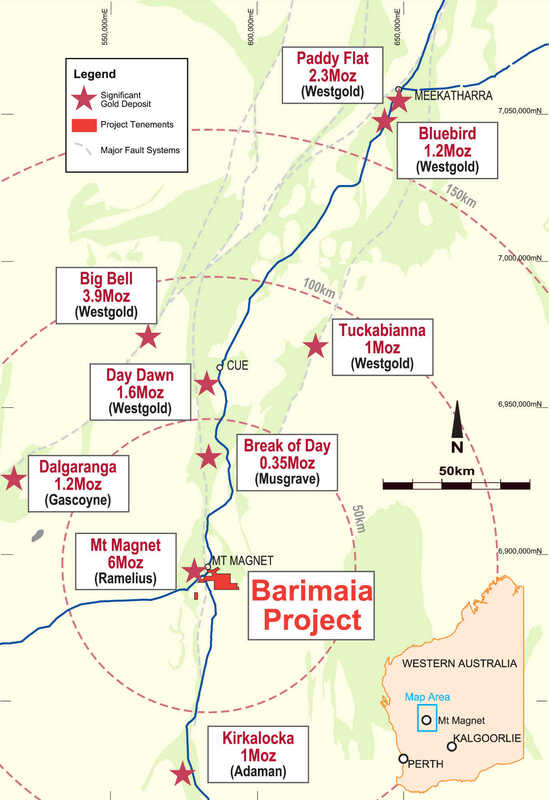 Genesis holds 100% of Metallo Resources Pty Ltd (Metallo) which holds the right to earn-in to an initial 65% interest in the Barimaia Gold Project (the Mt Magnet JV), with the potential to earn up to a maximum 80% stake. The Company considers the Barimaia Project to offer the potential for the discovery of large, low strip ratio porphyry-hosted gold deposits. The Project’s close proximity to Mt Magnet and the various gold processing facilities in the region provides a potential low-cost pathway to production should an economic discovery be made. Figure 2: Bedrock drill targets in the McNabs and McNabs East area. Porphyry extension target areas within white dashed outlines. 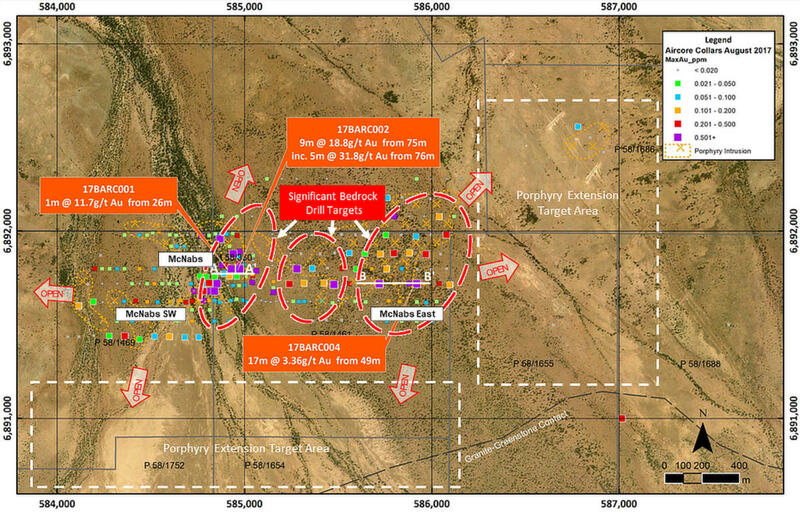 Drilling completed by Genesis and previous explorers identified three large bedrock gold targets associated with the McNabs porphyry system, as well as confirming an extensive area of anomalous gold mineralisation over a 1.0km x 1.5km area centred on the McNabs and McNabs East Prospects. Barimaia is a low-risk opportunity to assess a highly prospective ground package in close proximity to a major producing gold mine. Genesis is focussed on defining shallow gold resources capable of being rapidly and efficiently developed.